Cooking delicious and delicate cakes are often hidden in the secrets of cooking of meat. The soft and dietetic meat product – chicken, more chicken. With it you can cook tender chicken meat. Wash the chicken Breasts well. If you purchased it in the store, then soak the meat for 30-40 minutes in cold water. Separate the fillet from the bones with a kitchen knife (before preparation of the knife should be well sharpened). Onions and garlic peel and rinse under cold running water. Bulbs choose is not too large. Scroll through a meat grinder chicken, onions and garlic and carefully stir the minced meat. Season with spices, just do not overdo it! Do not use in cooking the chicken skin from the Breasts, there's little nutrients, and the meat can be stringy and tasteless. If you have not used all the prepared stuffing, put it in the freezer, he will remain there for 1-2 months. As spices for chicken mince quite a bit of black pepper and salt (better to use iodized). If the received forcemeat add the turmeric, finely chopped fresh herbs (dill, coriander) and some breadcrumbs, then you'll have the perfect preparation for a kebab. With wet hands make small sausages and put them on the prepared skewers. Leave it for 30-40 minutes in the freezer, then fry them on the grill or in the oven. 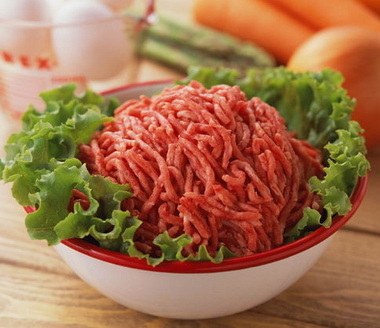 Minced chicken will be more nutritious, if it add 1-2 potatoes and 2 eggs. Before cooking the meatballs, roll the resulting minced meat in breadcrumbs or flour and cook over medium heat until Golden brown. Extraordinary cakes will amaze you and your friends.